The hunt for new opportunities is reaching a feverish pitch these days. The drums beat louder for hitting targets. Balancing short-term quarterly pressures with long-term growth strategies is on the minds of many business leaders. Seeking new opportunities is the lifeblood for enduring the ride ahead in the new digital age. One of the bigger challenges for leaders in B2B Marketing and Sales is achieving short-term objectives while keeping their eye on long-term growth. Revenue performance is pivotal. So are long-term growth opportunities. Pressure mounts quarterly for revenue gains, increase in market share, larger share of customer spend, new customer acquisition, and closing bigger deals. One-way B2B companies can balance this challenge is through deep as well as profound buyer insights. Consider deep buyer insights the equal sign in balancing short-term pressures with long-term growth opportunities. Without this equal sign, one side of the equation is sure to be off target. Buyer insights help get your company focused on meeting market and buyers needs. The gateway to increasing sales and revenue performance short-term while zoning in on long-term new opportunities. As I have often written about, the purpose of a buyer persona is to model archetypes of buying behavior. They serve, as the communications platform for breaking down complex buyer insights into a language the entire company can understand. I raise this point due to deep buyer insights focus on behavioral elements. This is the starting point for turning buyer insights into strategy. 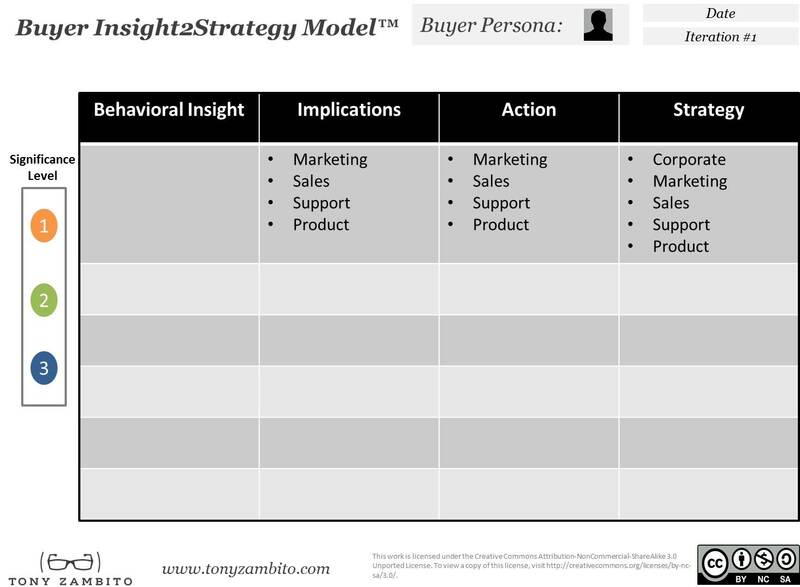 The Buyer Insight2Strategy Model. Link available at end of article. Behavioral Insight: this is a clear identifiable profound insight. I have written previously about the importance of distinguishing profound buyer insight from facts-based buyer intelligence. This is an important distinction to uncover new opportunities, which can help both the short-term and the long-term. Implications: in helping companies with buyer persona and buyer insight development, this component is usually the one most overlooked. However, it is important. An uncovered buyer insight can have implications on existing strategies, tactics, services, touchpoints, and more. Deep buyer insights are meant to change the status quo. Do not shy away from this component – it is a good thing. Action: we have all read or heard the phrase “actionable insights” quite often I suspect. Behavioral buyer insights generally warrant an actionable response. Actions are usually related to revising, redesigning, changing, updating, and re-aligning. I use these expressions to highlight the distinction between taking action and formulating strategy. If we look at balancing the short-term with the long-term, actions can impact short-term. Sometimes, a slight change or revision can have a very powerful impact. Strategy: uncovering new opportunities help organizations to keep market leadership positions. Ongoing buyer insight development creates an engine to drive growth. This strategy component is also the area for turning buyer insight into buyer foresight. While some strategies can be short-term oriented, there can be profound buyer insights, which leads to new opportunities. 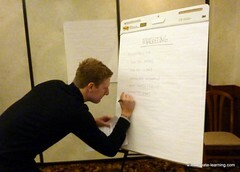 They can help formulate new strategies designed to introduce a new way of thinking as well as solving unmet needs. Giving you the foresight needed to stay ahead long-term. Modeling deep buyer insights is the key to finding powerful game changers. Taking you from the nice to know to – we have a powerful new opportunity position. Creating a platform for developing a wider gap from your competitors. Your customers will love you for this. They benefit from a new form of relationship. A relationship offering more focus on meeting their challenges. Buyer insights are powerful. Even more powerful is when you can provide your customers and buyers with foresight they themselves had not seen before.